I saw two movies over the weekend, one I would like to forget about, the other that I enjoyed. I just wish both of them were seen using MoviePass, but alas, the service that chopped its monthly fee by $30 is having a hard time handling the demand. I’ve been waiting about 5 weeks for my new card which still hasn’t arrived. Therefore, I will be holding back in October on seeing some of the movies I’ve been on the fence about (not Blade Runner 2047 for sure). I should have held off on Darren Aronofsky’s latest biblical delusion. After giving us Noah in 2014, he delivers mother! (yes, lowercase with the exclamation point). 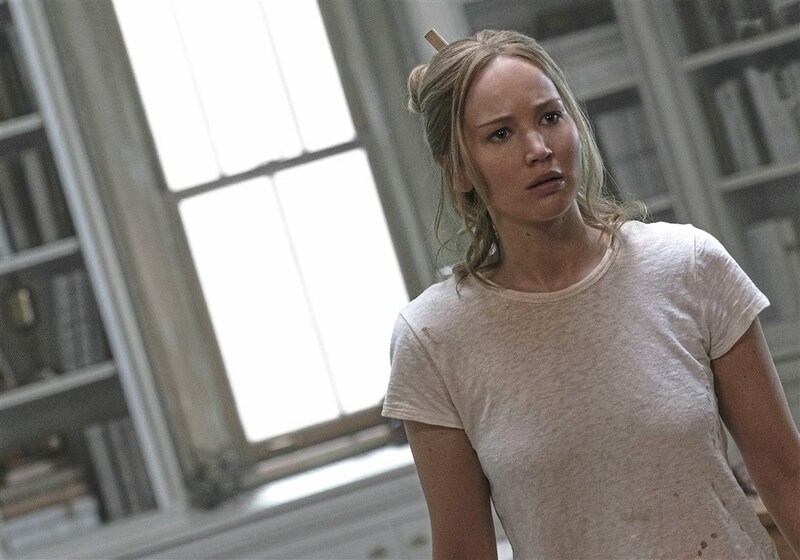 Starring (and I do mean starring… like all the time… in your face) his real-life love Jennifer Lawrence and featuring such respected actors as Javier Bardem, Ed Harris, Michelle Pfeiffer and Domhnall Gleason (who is in EVERY movie I swear), mother! is a steaming turd of a film that only becomes a little bit palatable after you realize the stunt that the director was trying to attempt. Nearly the entire film takes place within an old restored home in the middle of a large field. Lawrence plays the wife of a struggling poet (Bardem) who is in the midst of a remodeling effort within the house. Visitors end up straggling in at various times including Harris and Pfeiffer as an odd married couple. Slow and plodding in the beginning, things ramp up severely mid-way through when more visitors descend upon the home. What is billed in the trailer as a horror film is a total ruse and a lot of what happens (hell just about ALL of the film) makes no sense. Once Kristin Wigg shows up in a strange cameo role, I had already thrown in the towel. I won’t get into the symbolism here in case some of you brave souls want to take on the burden of sitting through this, but if you do see it, go Google the theories on the interwebs afterwards. Once I found out WHAT Aronofsky was “trying” to do here, this jumbled mess makes a little more sense. That being said, this movie is barely watchable and steers out of control at the end. The sequence near the end with an unrecognizable CGI version of J Law is so cringe-worthy that any artistic cred that was built up over the rest of the film is completely lost at that point. Aronofsky used to give us quality films early-on in his career. Requiem for a Dream is still a powerful look at drug addiction and I liked the Wrestler and Black Swan well enough. I just feel that he’s gotten a little too big for his britches now and maybe his infatuation with J Law tainted this film as well. I didn’t HATE HATE HATE it quite as much as my lovely wife did, but mother! is DEFINITELY the worst movie of 2017 so-far. A paltry 1.5 JRs for a film that everyone should try to avoid at all cost. Trying to get the taste of mother! out of our mouths, my wife and I saw a small Plan B (Brad Pitt doing his thing once again) production titled Brad’s Status. 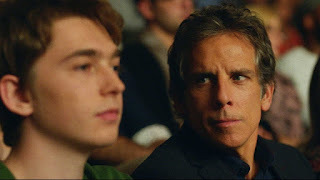 Directed by (ex-Amazing Race contestant and School of Rock creator) Mike White and staring Ben Stiller, Austin Abrams, Michael Sheen and the always-cute Jenna Fischer, Brad’s Status gives us Stiller in the title role as a father taking his high school senior son on a college visit adventure in Boston, MA. Brad is concerned about his “status” in his life having had some close college friends achieve more lucrative and notarial successes in their lives. Sheen (a political pundit and professor), Luke Wilson, White himself (in a brief role) and Flight of the Conchords’ Jemaine Clement pop in from time-to-time over the phone and in-person as Stiller’s link to the past and a reminder that his non-profit job doesn’t quite “match up” in stature. Various hurdles stand between Brad’s son Troy (a musical prodigy) being accepted into Harvard (a goal he wants to see achieved almost more than his son). Brad ends up using his famous Rolodex to pull some strings and help his son reach his dream. The bulk of the film deals with the dynamics of Brad’s vision of himself and his place in the world and wondering if he’s done enough over the span of his life and career. This film is a touching and interesting take on an authentic father-son relationship and a look at a dillusional (slightly-disturbed) man going through a sort-of mid-life crisis. Fischer is solid as Brad's loving and devoted wife but it’s really Abrams that steals the show here in my opinion. Following in the footsteps of Lucas Hedges' performance last year (Manchester by the Sea), Abrams is totally believable and authentic as Troy, a modern-day teenager who often has headphones in his ears but still has a respect and admiration for his family. Stiller is very good as well, but I really can only look at his face for so long in a dramatic role before I start thinking back to all the antics in Something About Mary. I do think he was properly cast though as I can't think of another middle-aged actor who could pull off a sketchy late-night meet-up with one of Troy's ambitious co-ed friends in a Harvard bar. I would definitely recommend giving Brad’s Status a try. It’s a small film that may not garner any Oscar attention but it’s definitely a well-made movie that makes you think and flies by (101 minute run-time) effortlessly on the screen. A solid 4 out of 5 JRs for a film that really makes you think about how much career status should factor into the view of your own life. Both of the movies are equally good and the review you have done is on the point. But the monthly subscription that you mentioned is strictly above normal cost.